Several dozen young people interrupted the quiet, reverential decorum of the governor’s office Monday afternoon. They held signs imploring Gov. Gary Herbert to “defend our future” as they sat in protest on the checkered carpet, singing and chanting in between the addresses of several speakers. 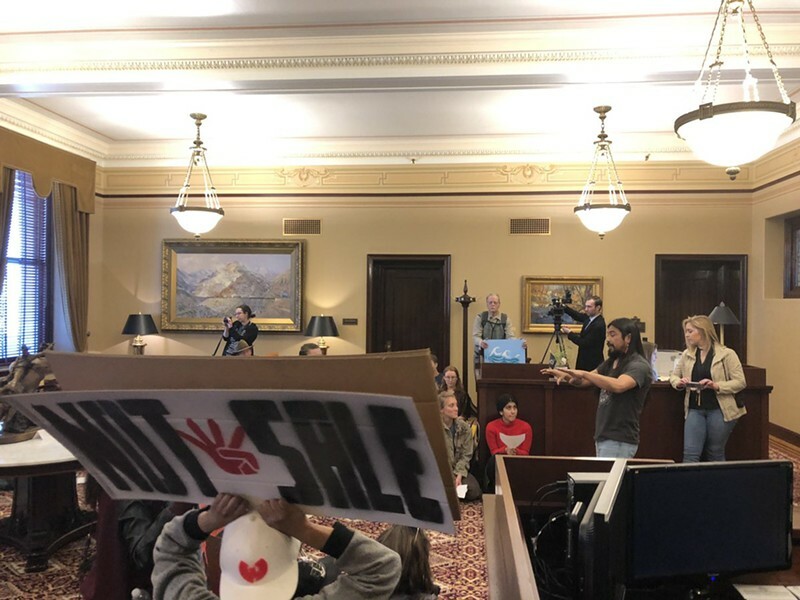 The crowd ventured to Herbert’s office to express their disdain for a Bureau of Land Management gas and oil lease sale taking place Monday and Tuesday. BLM will auction off 217,576 acres of public land in southeastern Utah to the oil and gas industry, much to the chagrin of many environmental groups and Native American tribes who say the space has cultural and archaeological value. The sale includes parcels near Bears Ears, Hovenweep and Canyons of the Ancients national monuments. 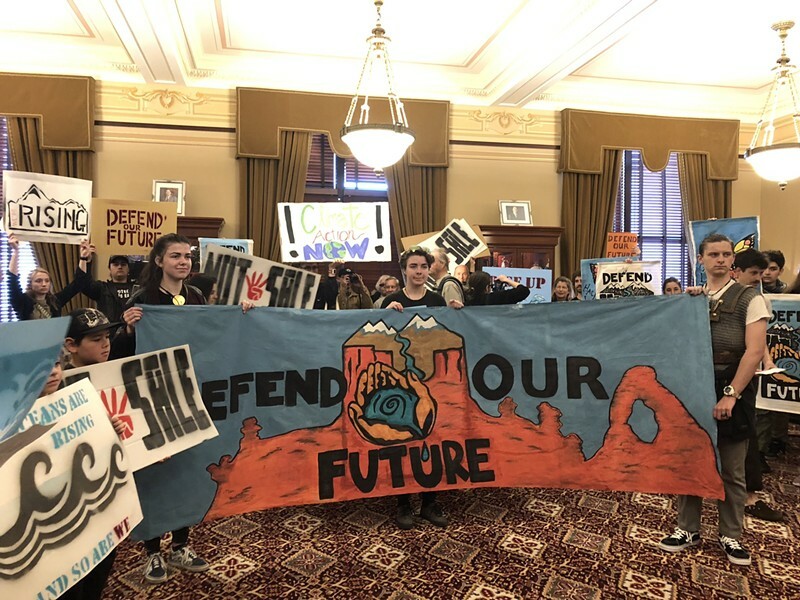 Building off the recent youth climate strike, most of the demonstrators were young Utahns concerned that climate change will affect their adult lives. “Even though the Utah state government signed a resolution to acknowledge climate change during the last legislative session, they haven’t been considering climate change, and they haven’t been considering the impact of these lease sales on our futures,” Eliza Van Dyk, a 20-year-old student at Westminster College, told City Weekly on the Capitol’s southern steps before leading a march into the building. About an hour into the sit-in, Mower came out to talk with Van Dyk and Mishka Banuri, a senior at West High and another event organizer. “I’ll pass it along. I don’t know if the answer’s going to change. Probably not,” Mower told them, referring to the compromise he floated last week. Mower said there was an “incredible amount of good work” in the last legislative session, including the passing of an anti-idling bill and an infusion of funding for air quality improvement. “Lots of different things are taking place, but they take place in the context of the legislative session, with the legislative process, with legislators passing bills and different resolutions,” Mower said. The conversation turned contentious when Carl Moore, the founder of Peaceful Advocates for Native Dialogue and Organizing Support, reminded Mower that the land was not the government’s to sell. “I just want to lend a voice, or a different perspective, because I’m indigenous,” Moore said, explaining he thinks the governor is being arrogant by trying to pick and choose which parcels to defer the sale of. “He’s playing with somebody else’s land,” Moore said. “It’s all of our land,” Mower replied. The 10-minute impromptu meeting ended shortly after the exchange. Moore asked Mower to relay what he said to Herbert. “His credibility is waning,” Moore told Mower before he walked away.